Become a Demon King after losing a fight to the trillion HP Trillion. The first game in Compile Heart’s Makai Ichiban Kan series is Makai Shin Trillion, a Dengeki Online report reveals. 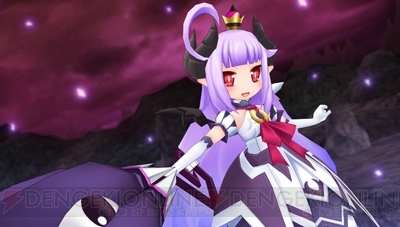 Set for a 2014 release on PS Vita, players take up the role of the Demon King Zeabolos after losing a bitter fight against the titular Trillion, whose HP clocks in at 1,000,000,000,000. After making a deal with a mysterious grimoire-wielding girl named Faust, who gives him his life back in exchange for his soul, Zeabolos sets out to pick another fight with Trillion, this time with the help of six Demon Lords who will act in his stead. Gameplay is said to revolve around raising and bonding with these six Demon Lords so that they can come out on top against Trillion, with each one being a girl that has their own quirks and flaws. While details in the online preview are sparse, it does introduce Luushe, a violet-haired girl with a prideful and haughty personality. Beyond that, each of the girls are said to represent one of the seven deadly sins, and the ways that players set out to train them can trigger special events, as well as result in different endings occurring. Additional details that are set to appear in this week’s print edition of Dengeki PlayStation include a tour by the developers of the greater setting of the Makai Ichiban Kan series as a whole—particularly Makai Shin Trillion‘s, which is said to take place in a demonic hell split across six different layers.